How do you ensure everyone has access to trustworthy information about Crohn's Disease and Ulcerative Colitis? 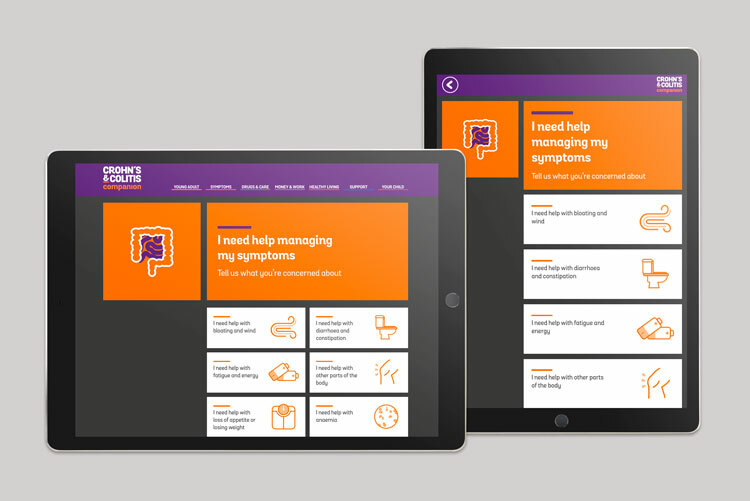 Crohn's and Colitis UK asked Lark to help them create an online resource where people could quickly and easily find trusted information. The site needed to work for a range of audiences including people who have been recently diagnosed with Inflammatory Bowel Disease (IBD), people who have been living with it for a while, and also their parents, families and carers. It needed to be easy to understand and navigate, while also addressing sensitive topics in an open and positive way. 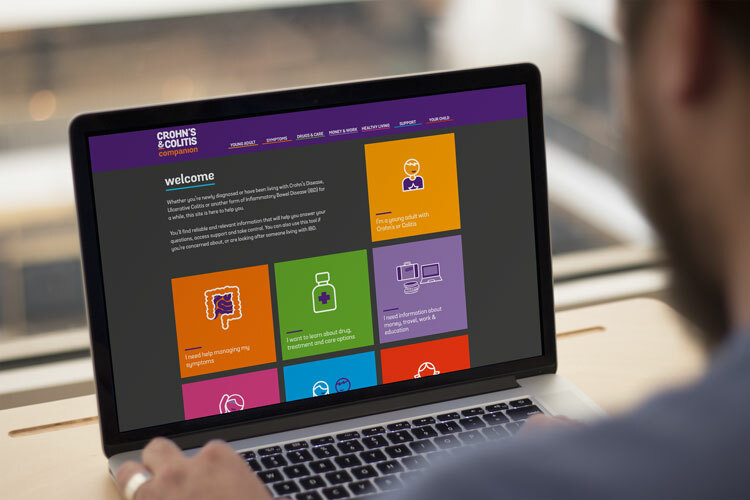 We carried out consultations with the teams at Crohn's and Colitis UK to understand what a successful website would do for their users. In collaboration with design/dev partner Electric Putty, we then laid out an app-like structure and page frameworks showing what information the site would carry, how it would be formatted, and how it would link to external information sources. Once that was agreed, Lark crafted the content using simple and clear language. "This is fantastic. I'm newly diagnosed and have loads of questions. This provides quick access to in-depth info on some of the issues I'm experiencing." "Excellent website very clear and easy to navigate." "Great site, nice and clear to see everything and find what you're looking for." There are also plans to turn the site into an app and extend some of the sections to cover a broader range of topics. Crohn's and Colitis UK were so pleased with our work that they've asked us to help them on a number of further projects – from digital impact reports and print leaflets to brand language guidelines and vision mission and values. How do you make a multi-national women's fashion brand sound truly unique? The brief: Mint Velvet have a strong visual identity and a broad, eclectic target audience. But they were lacking consistency and energy in their written content. What we did: First of all, we looked at what competitor brands were doing and how they sounded. We needed to understand where Mint Velvet saw themselves – as an aspirational brand or as something more down-to-earth. Then, we carried out a series of workshops with key staff members to dig deep beneath the surface and discover the brand's true personality. 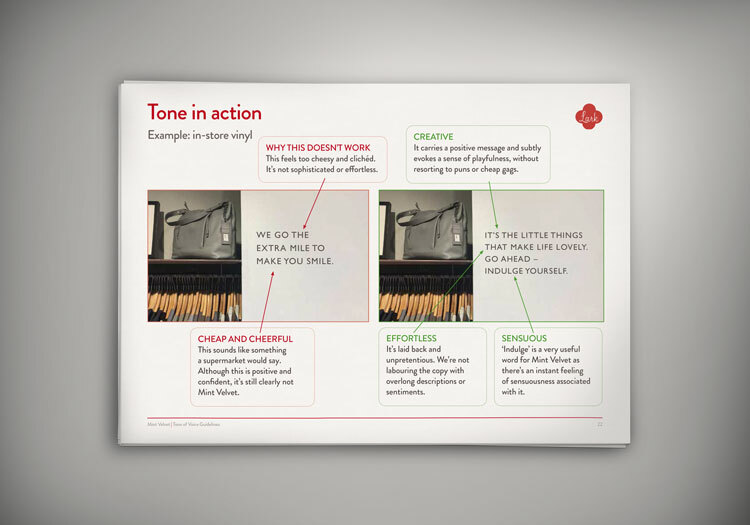 As with many retailers, the product descriptions can make the difference between gaining a customer or losing a sale. We created several descriptions and then worked backwards to encompass as much brand content as possible – refining the Mint Velvet voice as we went. 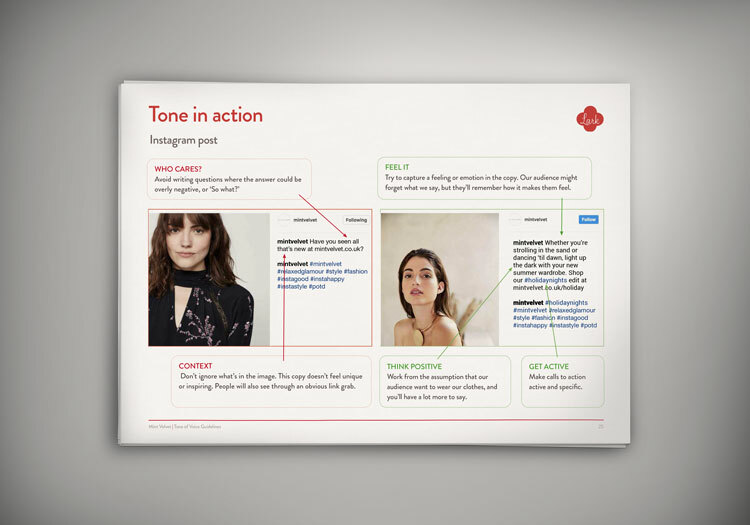 This came together in a tone of voice guideline document and content creation workshop – a day's training in how to create the right kind of content and use the right tone.